The Scuola Superiore Sant’Anna (www.sssup.it) is a public University with a special status admitting excellent students at graduate, doctoral and post-doctoral level in the sectors of engineering, medicine, agriculture, economics, law and political science. 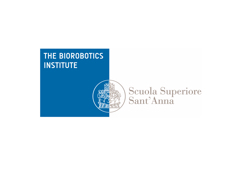 The mission of SSSA is to perform excellent research activity managed mostly by six Institutes.The Biorobotics Institute of Scuola Superiore Sant’Anna was founded by Prof. Paolo Dario with the mission of performing research in the field of advanced robotics and it is located in Pontedera, Pisa. At present the Biorobotics Institute includes almost 200 people, including seven Full Professors, two Associate Professors, many Post-Doc researchers, and about 90 PhD students. The Biorobotics Institute conducts theoretical and experimental research in biorobotics, a discipline characterized by a high degree of interdisciplinarity. For this reason it has a strong tendency toward integrating heterogeneous bodies of knowledge, of both scientific and humanistic nature, in order to study the theoretical, practical and social problems associated with the development of advanced robotic systems.The Biorobotics Institute has built and consolidated a vast wealth of knowledge and expertise in the fields of Robotics Service Robotics, Humanoid Robotics, Neurorobotics, Bionics, Neural Interfaces, Assistive Robotics, Robotics for Neurorehabilitation, Gerontechnologies, Biomimetic Robotics. Several robotic platforms have been developed in the framework of national and international projects, as for example humanoid robots, platforms for experiments on learning and sensory-motor coordination, cybernetic and prosthetic hands, wearable devices for biomechanical motion analysis, robotic systems for functional support and rehabilitation of human limbs, humanoid robotic hands and systems for personal assistance of disable and elderly people.